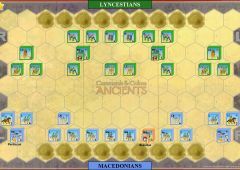 Ironically, the greatest Hoplite battle of the Peloponnesian War was fought during the Peace of Nicias (421-415). 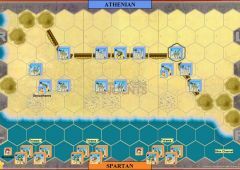 Athens was able to forge an anti-Spartan coalition. 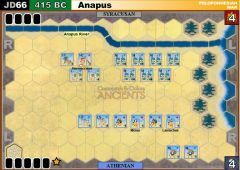 King Agis II of Sparta marched out to seek a decisive battle. 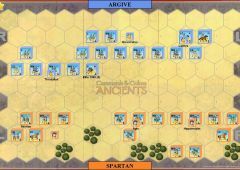 The Spartan army numbered about 12,000 Hoplites, while the Argive coalition had 11,000. 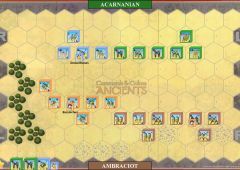 At first, the Argive army avoided combat, but when Agis emerged from a forest, he was surprised to find the Argive army drawn up close by for battle. 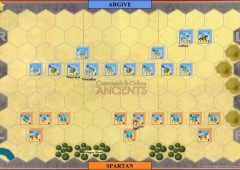 Agis hastily deployed, placing about 1,000 Spartans on the right, in support of his 3,000 Tegeans. 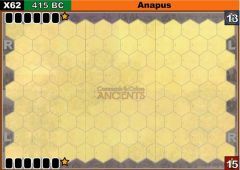 He commanded 5,000 Spartans in the center, surrounded by his personal bodyguard of 300 hippeis. 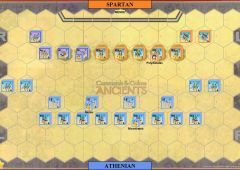 On the left were the 600 skiritae (Spartan rangers) and 2,000 freed helots. 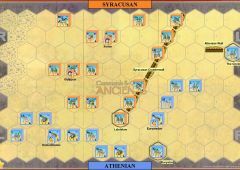 The coalition countered with 3,500 Mantineans and allies on their right. In the center were the elite “Argive 1,000” and 5,000 regular Argives. 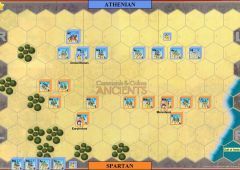 Their left was held by Laches with Athenian cavalry and allies. 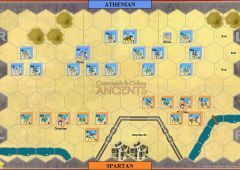 As the battle began, Agis gave orders to fill the gap in his line, but there was no time and the Argive right wing quickly enveloped and routed the Spartan left. 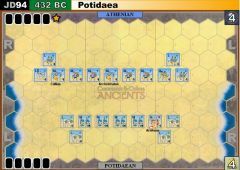 Meanwhile, Agis led a furious assault in the center shattering the Argive phalanx. 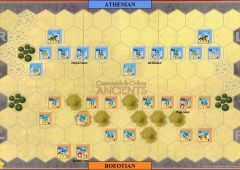 The Athenian left collapsed. 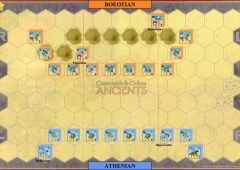 Agis kept his army under control, wheeled, and assaulted the Mantineans to complete his victory. 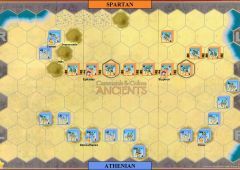 The anti-Spartan alliance was crushed and Sparta would enter the final phase of the Peloponnesian War in a position of strength. • The Elite Argive1000 unit is a special unit. 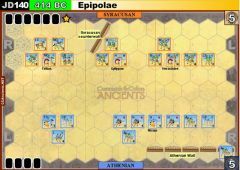 Place a special unit block in the same hex as the Elite Argive 1000 unit to distinguish it from the other units. 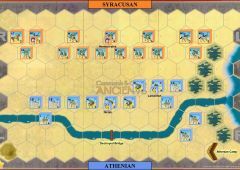 The Elite Argive 1000 unit is a unit of 5 blocks, but still rolls only five dice. 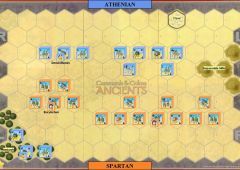 • The Skiritae unit is a special Spartan ranger unit. 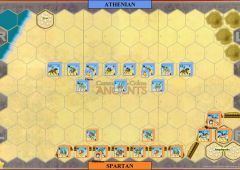 Place a special unit block in the same hex as the Skiritae unit to distinguish it from the other units. 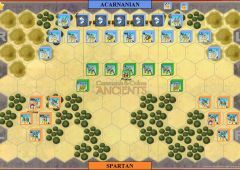 The Skiritae unit may move two hexes and still battle. 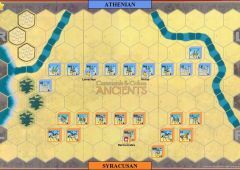 It will also score a hit for each leader symbol rolled in close combat (even when a leader is not attached or adjacent), and may ignore one flag. 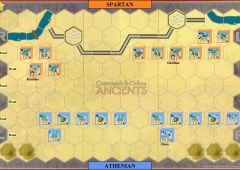 • Three Spartan units are special bronze five block MH units.